Poor Norton. More than anything in the world, he loves his Pillow. He carries Pillow with him everywhere and sleeps with him. When Norton eats, Pillow goes in the chair beside him at the table. Periodically, Pillow smells funky because Norton had flooded the bed (and Pillow) overnight or during a nap. Usually, I manage to discretely slip Pillow into the laundry and have him upstairs before Norton is any the wiser. Yesterday, that didn’t quite work out. Norton clung to Pillow when I changed him, and that was when I noticed that Pillow smelled vile. Since I couldn’t get Norton to let Pillow go, that was when I suggested that we should go give Pillow a bath. I kept my voice cheerful and excited, hoping that this wouldn’t result in too much toddler screaming. I was inwardly praying that Norton would eagerly pop Pillow in the washing machine and stare at the spinning Pillow with amazement. Or even that he would just watch quietly and mope about it. I was hoping for anything other than a complete and total toddler melt down. Want to take a guess what I got? If you’re guessing “melt down,” you called it right. When I tried to persuade Norton to put his beloved Pillow in the washing machine, he looked at me like a monster, clutched Pillow tightly, and backed out of the room. Once he’d escaped the laundry room, he turned and ran as fast as his little legs would carry him. He raced into my room and climbed into my bed, still clinging to Pillow. That dirty, stinky, damp pillow was in my clean, comfy bed. Gross. I offered Smalls (my bear from the Build a Bear Workshop) to Norton, and he snatched him with a hug. 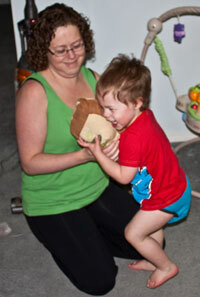 When he let go of Pillow, I took Pillow and brought him into the laundry room, then quickly threw him in the washer. Norton sobbed. It was the saddest, sweetest thing ever to see my little boy sobbing as he touched the washing machine window, crying for his Pillow. I tried distracting him with hugs, with my bear, with playing outside, anything that I could think of. After a few tries, he finally perked up over the idea of going outside. Playing on the slide temporarily distracted him, but he looked around for Pillow more than once. When I returned his Pillow, freshly laundered and dried, he was so beautifully happy. Here’s my boy with his Pillow. Hopefully, the next washing session will be a stealth one. Those are so much less painful for everyone. How does your child cope with the absence of a lovey?